Subscription renewals are now available for the 2019-20 season. To keep your same seats, you must renew by June 1, 2019. Changes and new subscriptions will be processed after June 1 on a first-come, first-serve basis for subscriptions that are paid for. Select the venue you want to attend. On the next page, choose your preferred seating section and the number of seats you are interested in purchasing. If you want to renew your same seats, request specific seating by rows and numbers, or if you require special assistance, describe your specific preferences in the 'Special Instructions' box after clicking 'Checkout'. 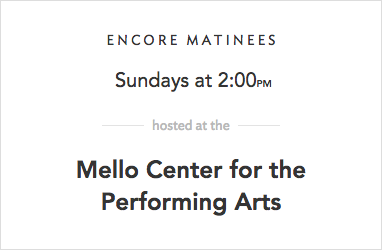 Please note: Subscriptions include classical concerts only. To purchase tickets for the Family Concert or Pops Concert, please contact the Civic Box Office. 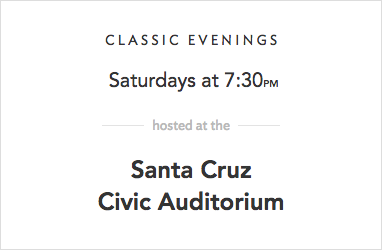 To purchase tickets for our Spotlight on the Symphony Recitals, please contact the Cabrillo Box Office.